Home to an annual Goth Festival and with a rich history steeped in myth and legend, Whitby is an atmospheric seaside town with so many ghostly and supernatural stories in its past they simply need to be looked at in more detail. 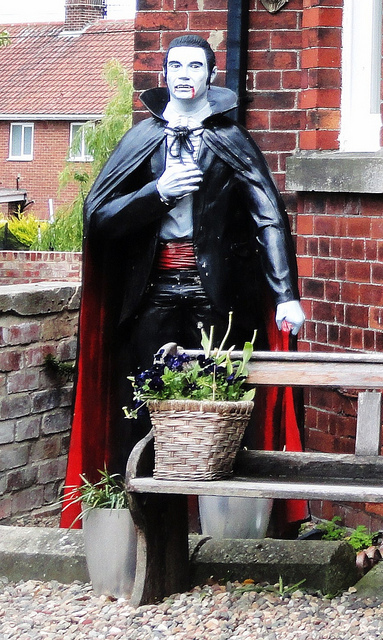 Many people stay visit Whitby (and some stays at our Whitby cottage🙂 to enjoy ghost tours and walks, so here we’re looking closely at some of Whitby’s most famous stories and legends, including the most famous of them all, Bram Stoker’s Dracula. 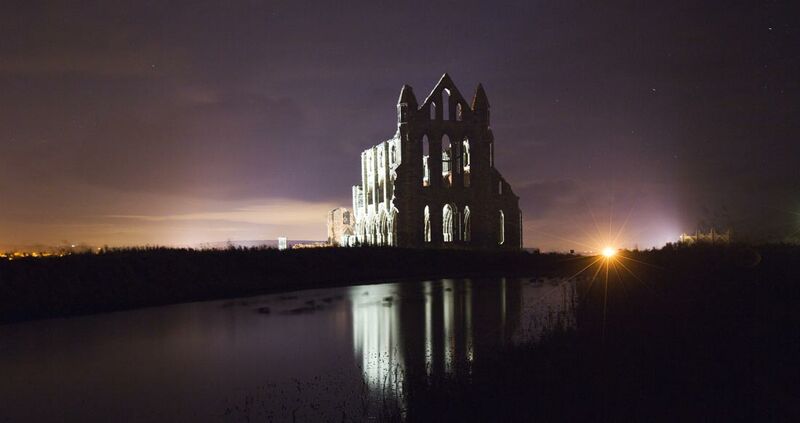 St Hilda founded the ancient Whitby Abbey, one of the town’s most prominent attractions and spookiest structures. Hilda built the Abbey in 657 AD and it began life as a simple wood and thatch structure, before being remodelled as the stone Benedictine Abbey it is known as. Local folklore says that St Hilda rid her new Abbey and the town of Whitby of evil snakes and serpents by throwing them from the top of the Abbey Cliff. The heat of her anger is said to have turned the serpents to stone. Of course, the reality is this is nothing more than a medieval explanation from the snake-like spiral Ammonite fossils found in the rocks below the cliffs. The legend has remained popular though and even led to Victorian geologists naming a local ammonite species after her – Ammonite hildroceras. Known by many different names but most commonly The Barghest, this large muscular dog-like beast is said to haunt the cliffs of Whitby. It appears in many works of fiction and recollection from Whitby and even makes an appearance as a huge black dog running from the ship that features in Bram Stoker’s Dracula. The Barghest stalks the North Yorkshire Moors around Whitby and preys on livestock and wild animals. Only creatures (or even people) who hear the blood curling howl of The Barghest are stalked and preyed upon. The village of Boggle Hole lies between Whitby and Robin Hoods Bay. 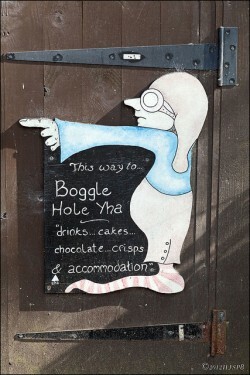 Local folklore says Boggles were little people, a bit like hobs and goblins. They live in the many caves along the coast and Hob Hole, which is near the village of Runswick Bay, is said to be home to an uncommonly gifted Boggle. Local fishermen were said to have believed the resident Boggle was able to cure whooping cough and many sick children were taken down to the cave to draw on the Boggle’s magical healing powers. Bram Stoker’s Dracula was famously inspired by Whitby and its haunting Abbey. Stoker was staying at a house on the West Cliff when he began putting together ideas for the story. The local myths and legends formed much of his inspiration and Whitby even features in the novel, as does the Barghest. Whitby is the breath-taking and atmospheric scene for Count Dracula’s arrival in England aboard the Demeter. Mina’s diary, in the novel, is the finest example of Stoker’s focus on Whitby, as it shows off many of the sights and scenes of the town, as Dracula too would have experienced on his fictional journey. Many tours and walks around Whitby take you to the sights mentioned in Stoker’s novel, from the Abbey itself to St. Mary’s Church graveyard in a hunt for the remains of the famous fictional vampire. The legends of Whitby make the town even more attractive and intriguing. 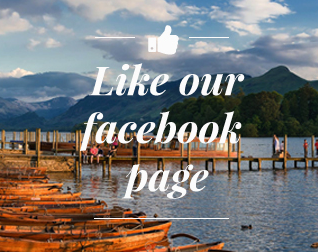 It is such a popular destination for weekend breaks and longer stays because it has so much history and a fascinating literary heritage.